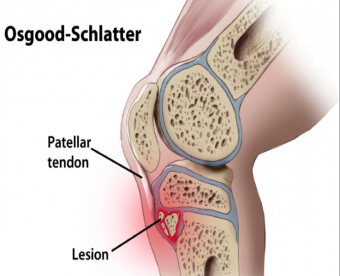 Osgood-Schlatter’s disease is an injury to the growth plate of the shin bone known as the tibia, which is located just below the kneecap. It is a common condition found in younger athletes. The large quadriceps muscle on the front of the thigh attaches to the tibia through the patellar tendon. The quadriceps tendon creates movement atthe knee joint by transmitting the force produced when the muscle contracts through the patellar tendon. In children and adolescents, the area of the tibia in which the patellar tendon is attached is around the location of the growth plate. Growth plates are an important structure that enable healthy growth and development of the bone, which later fuse once full bone growth has been achieved. Until the growth plates are fused, however, they represent an area of weakness in the bone. Forceful and repeated contraction of the thigh muscle can injure the growth plate. This most commonly occurs in sports which involve running and jumping and can be exacerbated during periods of rapid growth, as the thigh muscle and patellar tendon become tighter as the bones grow. This leads to increased pulling of the thigh muscle and patellar tendon on the shin bone and growth plate. 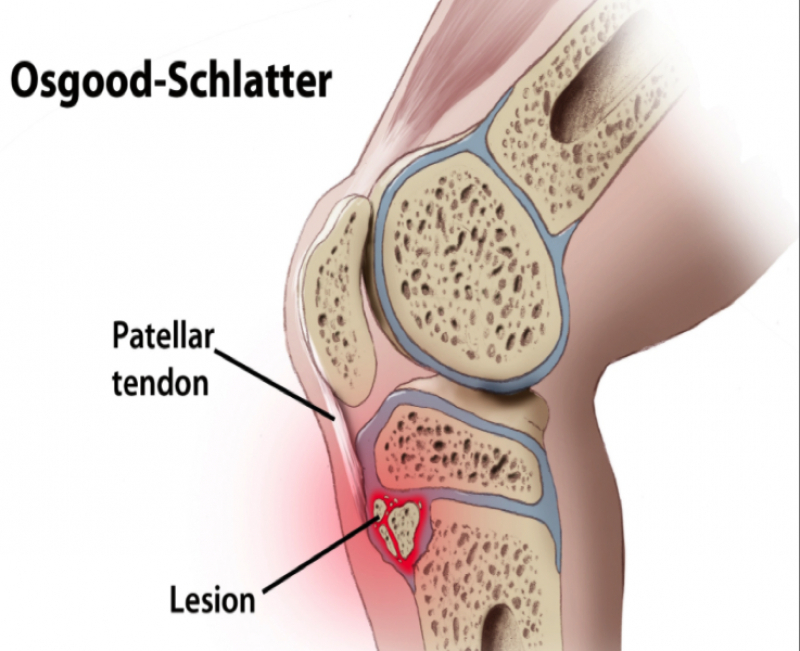 When the patellar tendon has been injured in Osgood-Schlatter’s disease, the painful site is located just below the kneecap on the front of the shin called the tibial tuberosity. The pain is most commonly felt during activities and exercise, including running and jumping. Often the area may be tender to the touch and look swollen. If your child has been experiencing pain below the kneecap, you should consult a physiotherapist. During the early phases of injury, limiting participation in sports and activities will help to restrict further injury to the tissues. To help with their pain and to control any swelling, you can apply ice. Ideally, this should be applied just below the kneecap for 15-20 minutes, every 1-2 hours. If you think your child has Osgood-Schlatter’s disease, you shouldn’t encourage them to participate in activities that reproduce the pain. This may worsen their injury and prolong recovery time. The assistance of a physiotherapist is important in the treatment of Osgood-Schlatter’s disease. Initially, they can assist in diagnosing the injury and the extent of the damage, and determine an appropriate management plan for return to sport and exercise. This may involve an initial period of rest or activity modification, regular icing, soft tissue release such as massage and stretching, treatments to assist in relieving pain, and the progression through a series of specific strengthening exercises for the knee, hip, and core. I believe it is important to empower patients to be able to help themselves ‎through education and exercises.